This is an entry for #IWGMTAJam! World of the Endless Vast (WotEV) is an MMORPG where players really drive the world. The max Class level is 20, but the max Character level is 100, so you can hit max level in 5 classes and mix their abilities to create a truly unique character! There are also economic classes that focus on harvesting, crafting, and even participating in the in-game real estate market and stock market! 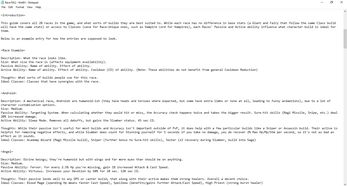 I've had an idea for an MMO in my head for a long time, but as I'll never have the resources for it and I really enjoy building characters and playing with economics in those sorts of games more than anything else, I've decided to just release a series of FAQs about the game. Plus it's fun to play with a concept where I can write about an imaginary game that has had unlimited resources thrown into it. 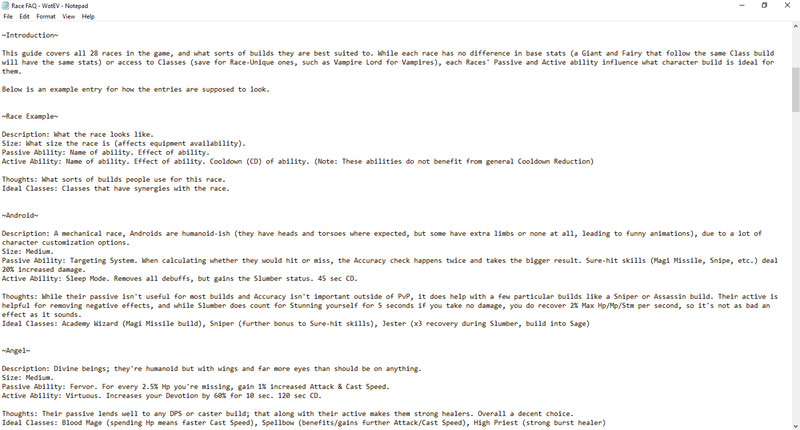 Currently there's only a Race, Class, and Game History (because of course I have ideas for fun patch incidents and the game's PvP as an esport) FAQ, but I want to come back to this at some point and add an Economy FAQ, as well as a few Character Build guides. If this seems interesting to you or you have something you want me to write up for it, feel free to let me know!